ʿAlam-Kūh (Persian: علم کوه‎; also: Alam Kooh) – Mount Alam – is a mountain in Alborz mountain range in north of Iran, Mazandaran Province, forming a peak of Takht-e Suleyman Massif. It is located in Kelardasht District of Mazandaran Province of Iran. With an elevation of 4,805 meters, it is the third highest peak in Iran after Mount Damavand and Sabalan . Douglas Busk, a British mountaineer, climbed Alam-Kuh via the east ridge in 1933 and again in 1934 from over the west ridge. The 800 m high, steep granite north face provides some of the most difficult and interesting mountaineering routes in the country and the climbs rank alongside major climbing routes in the European Alps. In addition to local climbers, the north face attracts European climbing teams. The first known ascent from the north was by a German party (Gorter/Steinauer) in 1936 via the northwest ridge. Subsequently, French and Polish teams established other routes on the north face during the 1960s and 1970, these being multi-day routes of high alpine standard. A British team followed with a successful ascent in 1978. The first winter ascent of the north face was made by Mohammad Nouri in 1991. Most of the fixed ropes were damaged severely during a major 6.3 magnitude earthquake and consequent rockfall in 2004. The mountain was closed to climbers for some months because the hazard of rockfall and loose cables. The mountain range supports permanent snow and glaciers. Although the southern slopes of the range tend to be dry and barren, the northern valleys leading to the Caspian Sea (which offer the best approaches to the mountains) are wet and lush with vegetation. 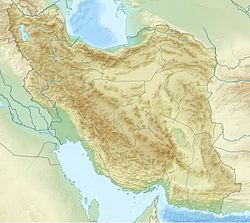 ^ a b c "Iran: 54 Mountain Summits with Prominence of 1,500 meters or greater" Listed here as "Kuhha-ye Alborz". Peaklist.org. Retrieved 2012-02-25. ^ "Alam Kuh, Iran" Peakbagger.com. Retrieved 2012-02-25. ^ Sources differ on the height of Alam Kuh. Due to its elevation being very close to that of Sabalan, either of these peaks may be variously listed as either the second or third highest mountain in Iran. Some sources give a significantly higher elevation for Alam Kuh of 4850 m. However, more reliable sources such as Peaklist (Alam Kuh is listed here as "Kuhha-ye Alborz") state an elevation of 4805 m based on Soviet topographic maps and modern SRTM data. This data supports Alam Kuh as the third highest peak in Iran. ^ D.L. Busk, Climbing in the Takht-i-Suleiman Group, N. Persia: The Alpine Journal, v. 47, p. 299–309 (1935). ^ D.L. Busk, The German expedition in the Elburz Range, N. Persia: The Alpine Journal, v. 49, p. 245-247 (1937). ^ "Deadly earthquake rocks Iran" CNN.com. Retrieved 2012-02-25. Wikimedia Commons has media related to Alam Kuh. This page was last edited on 17 March 2019, at 23:26 (UTC).